Step-by-step guidance and the necessary tools to enable any woman to plan an extended time away on any budget. Detailed steps for preparation for a retreat. Descriptions of three different kinds of retreats. Templates for how to use each hour. 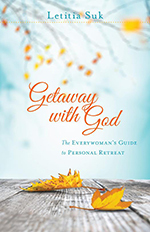 Guidance for how to design a five-day life-review retreat, including guided questions and ways to bring the retreat home. Links for how to locate retreat centers nationwide. Checklist for what to bring. Winner of the 2017 Golden Scroll Non-Fiction Merit Award of the Advanced Writers & Speakers Association.